Lots of bands are described as having a unique sound. At the risk of offending high school English teachers, who remind us that ‘unique’ is definitively singular, I submit that some bands are more unique-sounding than others. Case in point, Morphine. Founded in Cambridge, MA, by Mark Sandman and Dana Colley, Morphine really didn’t sound like any other mid-90s indie bands (or anyone since, for that matter). Sandman’s description of the band as ‘low rock’ is a play on words in at least two ways – the first is for the downtempo, crooning style of the songs. But what really made Morphine sound different from anything else on the radio was the musical line-up, which consisted of Mark Sandman’s baritone vocals, his two-stringed bass guitar played with a slide, Colley’s baritone sax, and drums – a distinctively low-pitched sound. They broke out with their sophomore album, Cure for Pain, and achieved modest college-radio success in North America, together with more mainstream success in Europe. 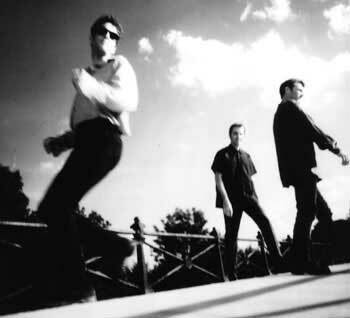 Shockingly, however, Mark Sandman suffered a fatal heart attack on stage in Rome at a 1999 show, and the band disbanded shortly thereafter—a short but notable chapter in Boston and indie-rock history. Notable doesn’t go far enough to describe Mark’s contribution to the Boston (and indeed, world wide) music scene. Morphine always seemed like a successor of Devo to me. Both were bands who followed their own personal visions and could be shoehorned into an “accepted” category only with some difficulty. Morphine were true orginals in a time when originality was getting harder and harder to come by (mmm….nu metal). There was a brilliant performance of theirs captured on a short-lived PBS program out of Buffalo, NY called On Tour. Should I find it, I’ll go ahead and post a link here. It was a really fantastic show and I am especially fond of the Morphine and Lollapalooza segments that they did. Anyhow, I really miss Mark and Morphine and with any luck, this post will have helped more people learn about their wonderful music. Hooray for Morphine!